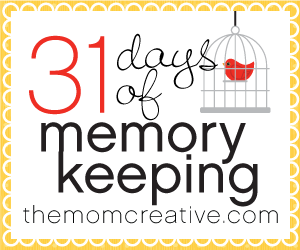 Welcome to 31 Days of Memory Keeping! Over the course of the month, I will also be offering some fun freebies to help get you going or continue on your memory keeping journey. I truly believe that everyone can do something to record their stories. Below is a list of each of the posts in this series. If you are joining in the fun and are writing your own 31 Days series, please link up below. Your link will automatically show up on each of the eight original 31 Dayers’ blogs. We’re looking forward to being inspired all month long! Looking forward to your series, Jessica!!! I’m looking forward to your series as well! Thanks for inviting us to join in this year. Can you believe the crazy response already? I am going to love following your 31 Days! I love this topic, but have gotten off track with it. I know this will inspire me!! I am looking forward to participating with all the hundreds of 31 Days Ladies…what a turnout!! I look forward to the help and inspiration. I had such great ideas when I first got married, and 3 kids and 25 years later, I’m more than a little behind. Can’t wait to be reinspired! Thanks for sharing!